In what should’ve been a routine swap-out of swing arm bearings, old for new, 3 out of 8 bolts joining exhaust header tubes to the engine sheared off – welded in by 10 years of galvanic corrosion. That meant three stainless steel grubs were still jammed, immovably, in the cylinder head and no manner of heating, sweating, grinding, drilling and screw extractors would budge them. Grimacing through a phone call to a local garage was rewarded with an estimate for a fix. Collecting from my house, fixing and dropping back off was going to cost me upwards of £300, not to mention £65 worth of head gasket replacement and various other gubbins needed to reassemble properly. There wasn’t really anything to think about. 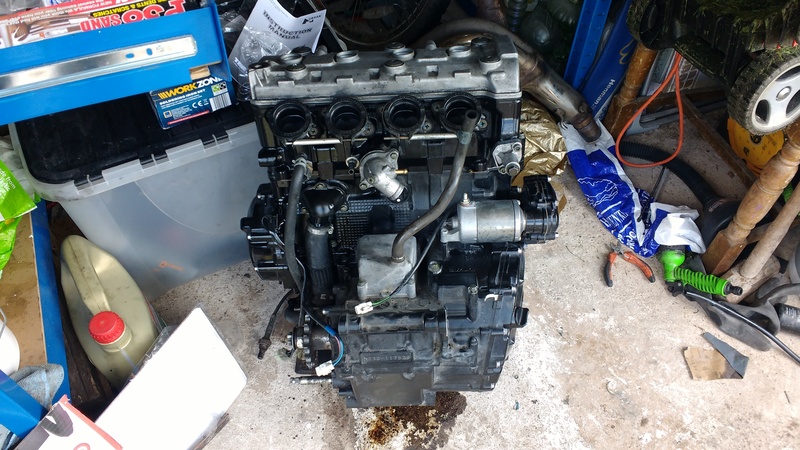 Buoyed up by my (as yet un-started) KTM engine rebuild over last winter, I’d decided to strip the engine head down myself. Slogging stuff with a hammer – It’s not all bad. Then I spent the best part of two days just looking at it, waiting for the weather to clear. I’d ordered new seals for the rocker cover bolts and a new head gasket and dropped into MachineMart to pick up a trolley jack that might help lowering/lifting the engine out of the frame. Cost so far – £130. 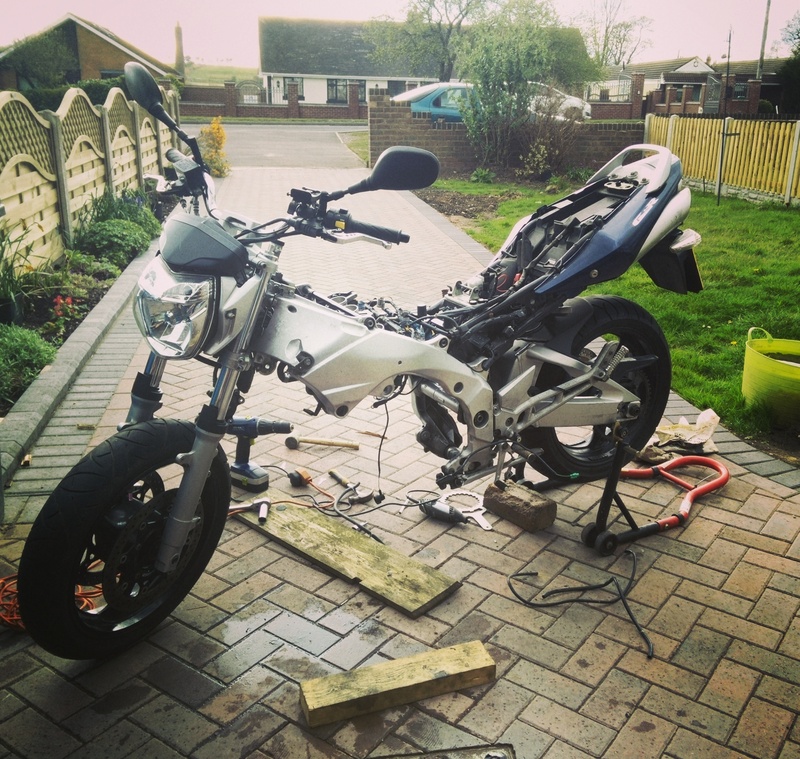 I skim read the Suzuki manual and poured over the Dan’s MC page for dropping a motor. At Dan’s bequest I rigged together some wooden blocks to balance an otherwise pointed sump on the trolley jack. When the weekend arrived I was all over it. Only to spend the larger part of my morning getting increasingly frustrated with the last engine mounting bolt. This one passed through the frame, a channel in the engine case then back through the frame on the other side. One bolt, obviously on the side hemmed in by brake pedals, was fused on and a cold chisel couldn’t help. I was starting to get annoyed by spannering on this 10 year old motorcycle. Everything was stuck tight. Careful as I could, I still chewed off some threads while using by dremel to cut the bolt in half. I whipped the bolt out triumphantly and moved to the final piece in the puzzle. Suzuki have built in a ‘thrust adjuster’, a threaded top hat shaped piece of aluminium that when torqued-up presses inwards on the engine, essentially clamping it in. And what have Suzuki done with the thrust adjuster? Yep – like all things bike, Suzuki have made it an obscure size that no socket will quite fit.. I learned a trick for popping the retainer grommets on each valve spring. Seems caveman but did me proud. Socket (with the wrench end plugged with paper) placed over each one and slugging it firmly with a hammer. Took 20 minutes to have all valves out and set out on the table. Just protect the bottom of the head if you do. It might seem like a lot of work, but taking a disassembled cylinder head into the garage for drilling and helicoiling cost me £100 all in. Seemed a bit steep, but it was precision job that I couldn’t trust my ham hands to do so paid up willingly. A couple of valves looked like they’d seen a bit more heat than the others but were easily reusable. Especially considering each valve would be £48. I reused the valve stem seals too as there were no signs of oil in the exhaust – great considering I could only find them for £6 a pop and there are 16 of them. I lapped each valve in and reassembled the springs with a DIY valve spring compressor (an angle ground part of a tap and a hand clamp). Not nearly as much mayhem as with the KTM, which has springs that only become malleable under the barrage of swear words and power screaming. I siphoned a little petrol from the tank and tipped a bit in each intake/exhaust port to check how good the valves were seating. A couple needed re-lapping but I was in the clear otherwise. Before (left) and after lapping. Note the nice matte finish. A good thing so I’m told. Rusty old nubbin needed replacing. I wasn’t surprised to find another specialist tool was required to put the head back on. Not sufficient to just use a higher torque spec, the manual stated each bolt to be tightened to 23nm (again sequentially) before using an angle gauge to add 60 degrees worth of turn. Fortunately these are only a tenner online. There was still time for one last disaster. Kept outside one night (no room in the garage), the rain cover had been blown off despite its bindings. Subsequently, from looking at the water puddled atop my intake valves, it looked like there had been pretty heavy rain. I’d plugged the intakes with kitchen roll to keep dust out, but hadn’t foretold the need to be waterproof either. I blasted as much water as I could out with my air compressor and resigned to having to rush through reassembly, keen to not let the valves sit in pools of water for any length of time. Assembled, it was a little disappointing the weave hadn’t disappeared after driving in new swing arm bearings. One of them was certainly dead, gritty as you like. But here I was, being pulled all over the place of the bike’s own accord. Better still, in taking the best part of two months to work through essentially every chassis bearing, my MOT had expired. I picked it up this morning after it stayed at the garage overnight for some quick fixes. A cracked tyre valve, dry brake hangar and slightly out wheel alignment. £54 quid for the MOT and labour. The mechanics had given it a test run up and down the road and had the answer about my handling. Steering head bearings. The repair job that just kept giving (headaches). Apparently I’d screwed them up too tight, causing the front to grab. It took 20 minutes to slacken these off and true to form, she rode like a beaut once more. So, after a long couple of months I’m back riding once again – though this time I’ll be on the pushbike for the six minute commute to work. Short runs are probably accountable for the rusty camshaft and I don’t feel like undergoing this much work anytime soon. Was it worth the anguish? All in, the work cost me £300 – cheaper than the garage and I’ve got a nice new trolley jack. But would I do it again in a hurry? Well, I’m going to let my hammer blow hands heal a while first.